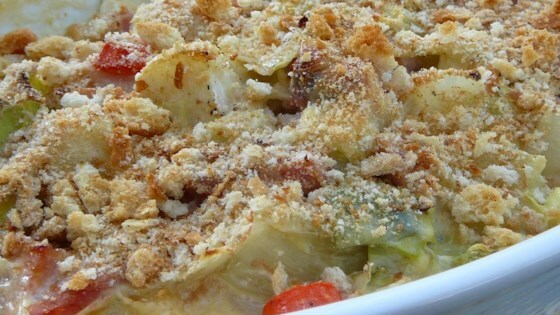 "A cheesy scalloped cabbage and ham casserole. Great for potlucks. A bag of slaw can be substituted for the cabbage." I would give it a 3 1/2 stars. It was good but my husband said it isn't something he would go back to seconds for. However it is a good budget meal! Oh my gosh! Soooo rich! I didn't even like cabbage until I tried this dish. Made it exactly like the recipe, which I don't usually do, and it was perfect. Very easy and tasty..I precooked the slaw and onion in the microwave to save on cooking time. I also added chopped tomato for color. I definately would make this recipe again. good, different, and easy. Used bag of coleslaw and subbed cheddar for the american cheese. Will make again.